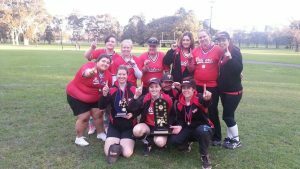 The Eastern Raiders Softball Club was formed in 1990 following the amalgamation of Mount Waverley Softball Club and Blackburn North Softball Club. We currently field two open women’s teams in the Melbourne Softball Association winter season played at Fawkner Park, South Yarra. In addition, we are also a thriving summer club based at Jells Park, Wheelers Hill, part of the Waverley Softball Association. We welcome players of all ages and capabilities to join us. We field teams in all age groups from U11 through to Senior Open 1.Opportunities exist for girls of all ages to advance through various grades of competition and to participate in teams for the Waverley Association, State and National Championships and even Masters! (over 35). We also cater for boys, who can play in our U11 and U13 competition. We encourage all family members to join in, and our main focus is fun and participation. We like to see our players and parents become involved in coaching, umpiring, scoring and any other facet of the club. We look forward to welcoming you to our club!